Skylights are the perfect way to bring natural light into your home without compromising privacy. Skylights will save you electricity on lighting and add a stunning new feature to your home. Velux Fresh Air Skylights can be remote control operated, with remote operated blinds, and even solar powered. At Webster Window and Door, our team has carefully selected Velux for our Skylight selection, because they carry the most efficient skylights to provide the best value. From Solar powered to remote operated, every home is unique and each of these skylights can add a unique touch to your home. Explore Velux’s website for more information about styles of Skylights. Contact us if you have any questions or make an appointment to come into one of the best window and door showrooms in Saint Louis. Velux is the world’s leader in Skylights. Skylights provide balanced, natural light from above, which makes colors appear truer. With homes built so close together windows in bathrooms and bedrooms often spend their days with draperies or shade pulled shut. 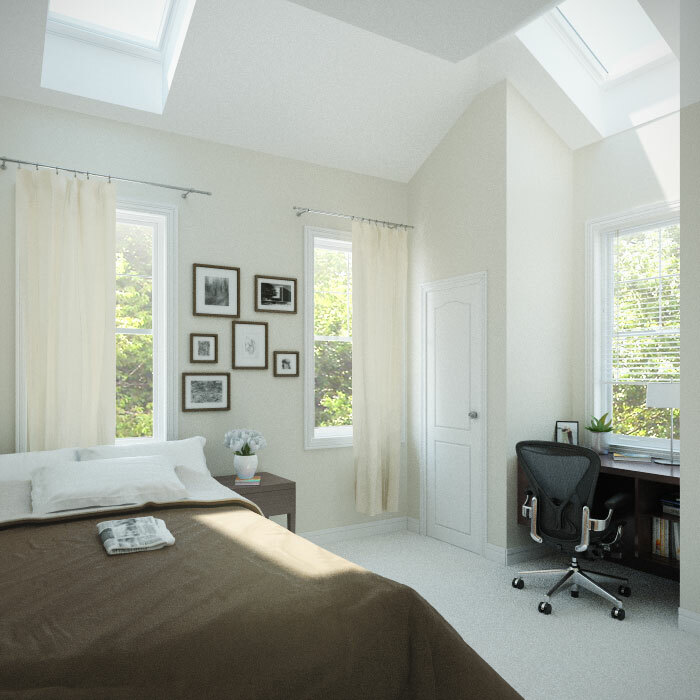 Skylights provide daylight and a view without sacrificing privacy. Modern skylights come with blinds or shades that allow homeowners to diffuse or block the light during certain times of the day.